A month or so ago, it's entirely likely that you were caught up in the frenzy surrounding Draw Something, trading goofy doodles back and forth with friends as you played the popular word-guessing game. But now, you might be one of the millions of people who've unceremoniously dropped Draw Something out of their lives. 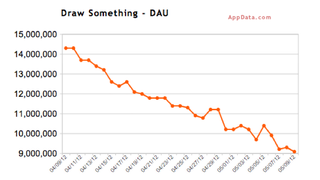 The latest number-crunching from stat-tracking website AppData shows that around 5 million people appear to have stopped playing Draw Something on Facebook. The game's success made developer OMGPop into a feel-good success story about six weeks ago. Sure, the company's $210 million buy-out by the Zynga juggernaut sparked a minor war-of-words. But, overall, the story arc of a grass-roots phenomenon cashing out in a big way imparted a warm fuzzy feeling to underdog cheerleaders everywhere. But this new decline might mean that the heyday of the Pictionary-style game is over. This drop-off makes me the think of the difference between a fad and a staple. These numbers make Draw Something out to possibly be a fad. A thing that lots of people flock to suddenly and then abandon with similar alacrity. But, based on today's billion-download announcement, it looks like Angry Birds has become a staple. The Rovio game's become part of people's regular entertainment diet, a diversion that they consume daily. OMGPop's already working on their next game, a hip-hop-inflected version of Farmville called Streets. Kotaku has reached out to the company for comment and will update this story with their response.